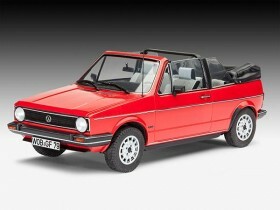 Introduced in May 1974 the Golf stood in stark contrast to its predecessor, the VW Beetle. The angular shaped motor car had for instance front-wheel drive and a water-cooled front engine. The open top version came onto the market five years later. Often painted red, the wide roll-over bar earned the car its nickname of the day the Strawberry Basket . Nevertheless the car quickly blossomed out to become the most prolific convertible in the world at that time. Amongst other things the good workmanship on the convertible produced by the Karmann company in Osnabrück was held in very high esteem. The 70 and 110 bhp engines were also deemed to be sufficiently powerful. During the 14 years it was in production 389,000 units left the production line and the car appeared in several television series.